Itâs a sight you can only see in Pyongyang: Tens of thousands of performers dancing with military precision to patriotic anthems, as a giant stadium-sized mural of North Korean iconography changes behind them. 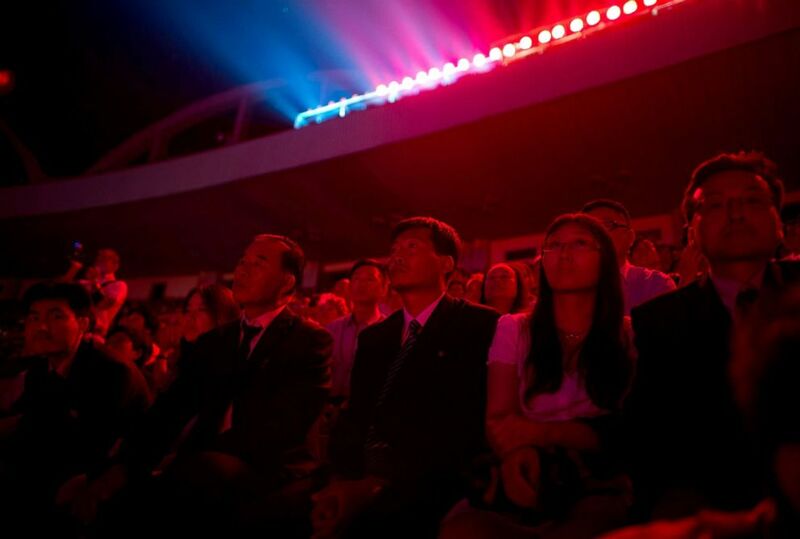 A spectacle beyond any Olympic opening ceremony. It was one of the largest shows on Earth, and then in 2013, it was all gone. But starting next week, itâs back. After a five-year hiatus, North Korea is expected to bring back the iconic Mass Games during the countryâs National Day celebrations, which will mark the 70th anniversary of the founding of the country. The Mass Games are a 90-minute, stadium-sized, synchronized gymnastics performance featuring as many as 100,000 volunteer participants against the backdrop of a massive, ever-changing human-powered âJumbotron." 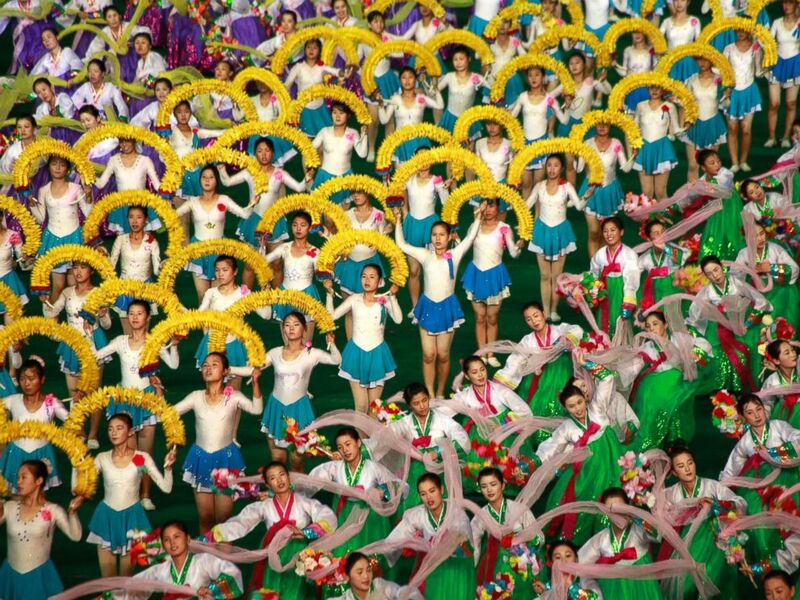 Performers participate in the Arirang Mass Games, in Pyongyang, North Korea, Nov. 14, 2012. The âArirang Festival,â an iteration of the Mass Games, was first performed in 2002. It was themed after the Korean folksong "Arirang," which is about a star-crossed couple that yearns for each other after being separated -- a not-too-subtle allusion to the divided Koreas. The Arirang Mass Games were performed annually until 2013, after which they were discontinued for unknown reasons despite their popularity. Kim Jong-Il even took then-Secretary of State Madeleine Albright to an earlier version of the games in 2000. 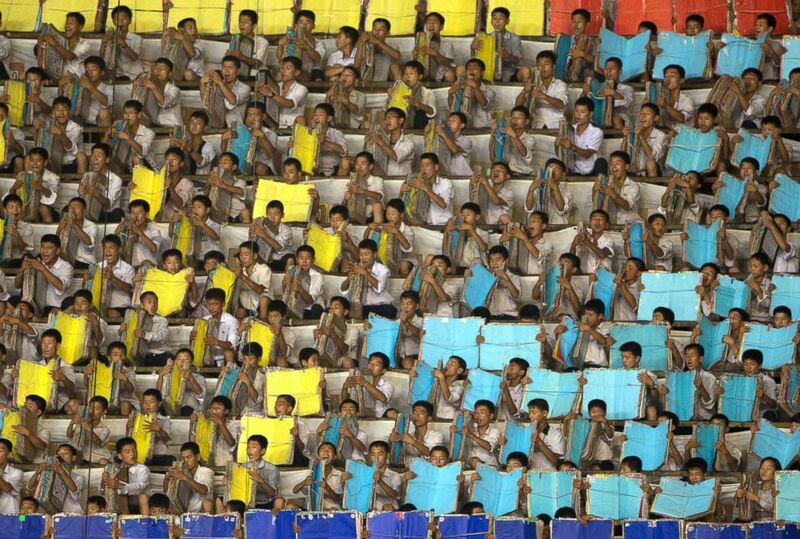 Performers create a giant picture in the stands as other march in formation during the Arirang Mass Games in Pyongyang, North Korea, Sept. 18, 2013. 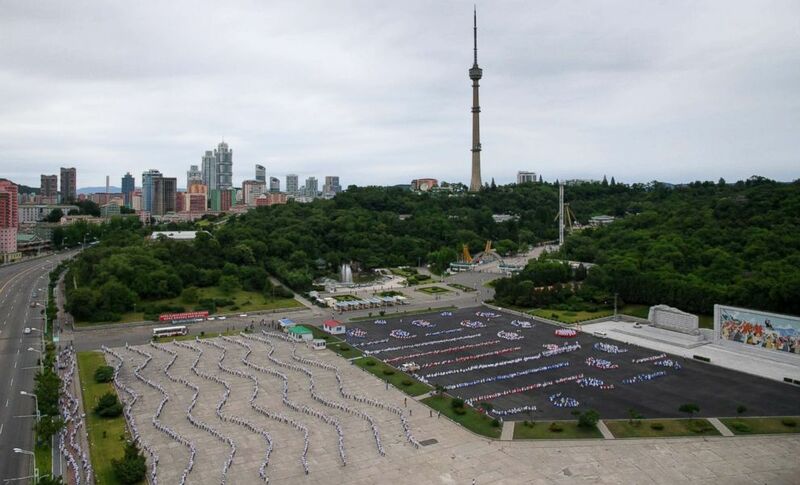 On Aug. 14, 2007, the Guinness World Records recognized the Arirang Mass Games as the largest gymnastics display in the world, with 100,090 participants. The games take place at Rungrado May Day Stadium in Pyongyang, the largest stadium in the world in terms of capacity, and they have historically run for a month or two between sometime between July and October. Spectators watch the Arirang Mass Games at the 150,000-seat Rungnado May Day Stadium in Pyongyang, North Korea, July 26, 2013. One of the most spectacular sights at the Mass Games is the giant mosaic "Jumbotron," which is made up of tens of thousands of individual students. The North Koreans have boasted it to be the "largest picture in the world." In order the get the giant ima ge to change instantly, each student is given a unique book with up to 170 pages. When all the students, who are sitting in seats across the stadium, flip the pages together, it changes the massive image emblazoned across the stands. Performers warm up prior to the Arirang Mass Games at the 150,000-seat Rungnado May Day Stadium in in Pyongyang, North Korea, July 26, 2013. How long do they practice for? Many of the performers, especially the ones working the mosaic flip books, are students who spend up to eight months training and practicing. 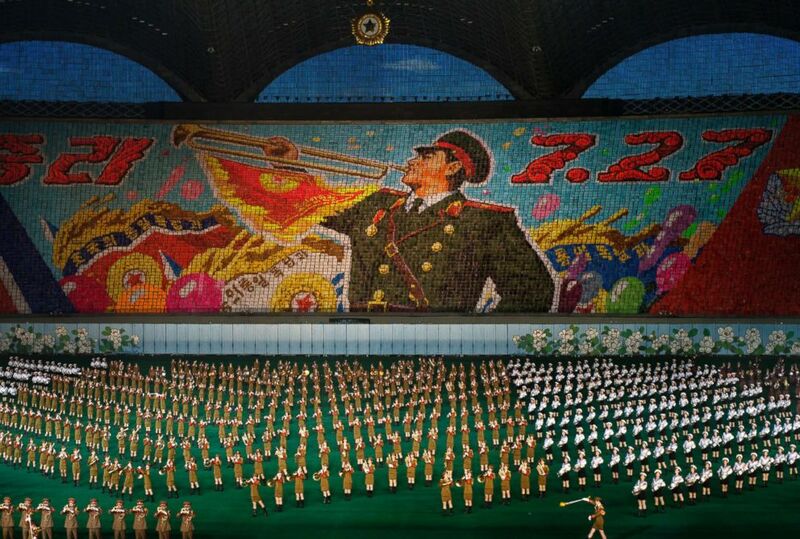 In 1987, the late North Korean leader Kim Jong -Il said that Mass Games were "important in training schoo lchildren to be fully developed communist people" and to "foster particularly healthy and strong physiques, a high degree of organization, discipline and collectivism in schoolchildren." Kim Jong-Il continued: "The schoolchildren, conscious that a single slip in their action may spoil their mass gymnastic performance, make every effort to subordinate all their thoughts and actions to the collective." Performers in formation practice in a public square beneath the Arch of Triumph in Pyongyang, June 10, 2018. The gathering was understood to be a rehearsal for an expected upcoming Ar irang Mass Games to be held in September. Why have the games been relaunched? While the games ran continuously between 2002 and 2013 they proved to be a huge tourism draw. And tourists bring in cash. According to Koryo Tours, the cheapest seats in the house will set foreigners back 100 euros ($116) each. VIP tickets are priced at 800 EUR ($930) a seat. Meanwhile, Chinese businessmen in the provinces just over the North Korean border are being given free tickets to try spurring investment flow, Radio Free Asia reported. For a country still facing severe U.N. sanctions, the incoming money could help.